As we have mentioned earlier, the Knights of Saint Andrew organization is more than just a bunch of brothers who get to wear different Hats to our meetings, although admittedly it is an attention getter and they look pretty darn good. 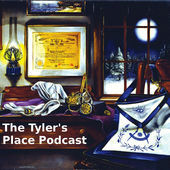 It is also more than the group responsible for putting on the 29th degree for our reunions, but that is a pretty good way to get ourselves known, at least in the confines of the Tiled Lodge. As you have seen exemplified in the Scottish Rite 29th degree, we demonstrated that the great virtues of Knighthood are: humility, patience, self-denial, charity, generosity, clemency, virtue, truth and honor. 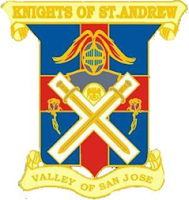 First and foremost, The Knights of Saint Andrew is chartered to be a service organization to the Bodies of the Valley in which they serve. The San Jose Chapter members are active 32o Scottish Rite Masons who may assist in helping to carry out many of the needed tasks which help the valley operate its many affairs. Up to now our main focus has been in seeing the Lodge room set up for Stated Meetings and helping to make sure the Lodge is properly Tiled. There are many other things which can be done and the Knights are always looking for more members to assist as that list continues to grow. Except for participation in the 29th degree, you do not have to wear a Tartan or Kilt, but of course as a member you are entitled to wear one. The wearing of the Glengarry cap is a sign that you are a member of the KoSA in Good Standing. If you would like to be an active member of the KSA and have not witnessed the 29th degree or have not been knighted, we will be happy to provide the knighting outside of a reunion. Our monthly meetings are the First Tuesday of each month @ 7:00 PM. You are already a Knight of Saint Andrew by virtue of having gone through the degrees up thru the 32nd. If you have an interest in providing any of a variety of services to the San Jose bodies. Why not contact us and come to the next meeting. John Ungar is officially listed as the Secretary. We look forward to hearing from you.